Did I mention the whales are here! It is winter time in Hawaii which means Maui has become the epicenter for whale watching. Humpbacks travel 2,500miles from the Alaskan feeding grounds to mingle, mate, and have babies here in Hawaii. The shallow waters off leeward Maui are thick with Humpbacks this time of year. It is a bit nerve racking for boat captains like me but also very rewarding. If you were wondering what time of year is best to see the whales it is now through March. Whale watches are going out all day, but guest are also seeing whales on snorkel trips, dinner cruises, even kayak trips! What makes this area the best whale watching area in the world in my mind is the fact that these whales prefer near shore waters so they are very close, being Humpback whales you can see some incredible acrobatics out of the water, and the sheer density of whales here right now makes it seem like whale soup! Every day out on the water is different. Being a naturalist and captain I am constantly seeing new behaviors. Not to mention I am surrounded by a very energetic vibe. Maui really comes alive during whale season and it is easy to feel the excitement. For a photographer taking pictures of whales can be the challenge of a lifetime. Wildlife photography is already tough, but when you add in the difficultly of being on a moving platform and trying to capture an animal who spends a tiny fraction of its life at the surface it can be a daunting task. Having been around these whales for the past three winters I have learned a lot about their behavior which can give me an advantage in not just taking their photos but also putting other people in the right position as captain. When I have a passenger on board catch a really amazing photo I can tell just by looking at their face that their whole trip to Hawaii was a success, even if nothing else happens. I have been incredibly busy putting other people in the right spot for photos but have managed one or two on my down time. Enjoy these and bring on February, the peak of the whale breeding season! Sometimes being lucky and being prepared seem to go hand in hand. As Heidi and I were out enjoying a beautiful Maui winter morning on our two person kayak we saw a young whale, not too far off, playfully waving its white pectoral fins in the air. As we sat there entranced by the playful newborn we noticed it was slowly getting closer. As it did I slowly lowered my waterproof camera into the water, pointing it towards the baby. As the baby neared our kayak I was amazed just how big these calves are. They truly are every bit as big as a small car. That is when a much, much larger dark shaped emerged below us. This calf's ever protective mom had been hiding nearby the entire time. But with the calf so close to the kayak she figured now was the proper time to swoop in and take the calf off to safety. Heidi and I were both shocked to see the mom turn right towards our kayak and swim 10ft underneath us with baby in tow. Just as quickly as we came upon these whales they were gone, leaving us to the quiet peacefulness of the ocean. The more you explore Maui the bigger it can seem. There are so many secret hikes and hidden waterfalls, dive sites, sea caves, wilderness trails, lava tubes, and more. I think even if you are not a water person you could still have endless days of fun exploring the island of Maui. Today after an aborted Peahi paddle in session and a forfeit baseball game we made spur of the moment plans to go tackle the Makaiwa Hike on the road to Hana. I had heard about this hike from different sources and like most of the secret hikes here on Maui, the entrance is hard to find. The beginning of the trail is very overgrown with a lot of crouching down, pushing thru foliage, and avoiding spider webs. Then your view opens up and you realize you are on a steep ridge line looking out over the wild Pacific ocean. Walking further you can see all the way down the northeast coastline of Maui. When you reach the end of the ridge you are still quite high up from the water, so to get down a series of ropes have been attached in convenient areas to help ease your way. They are pretty handy for getting back up as well. Down at the lava rock point the waves crash sending spray thirty feet in every direction as other waves disappear into the depths of a massive sea cave. Razor sharp teeth line the mouth of this white mouth moray eel. Many divers are threatened by this open mouth behavior of eels but if you do a little research you will know that eels open and close their mouth all the time to pump water over their gills. Often mistaken for sea snakes, eels like this one are actually a kind of fish. Their dorsal fin extends all the way down their back and they use gills to breath oxygen in water. Every once in a while a free diver has their hand sliced open by a lightning fast moray eel bite. After seeing these close ups I am extra glad that it hasn't happened to me! The visibility at five graves, aka. five caves in Makena had been incredible the last few days so Heidi and I jumped at our first opportunity to grab scuba tanks and kick this new year off right. This is such a great place for green sea turtle sighting but this dive turned out to be much much more. We also usually spot very small nudibranchs here, but on this dive I brought my big lens, a 10-22mm super wide angle in hopes of some bigger creatures. We were in luck! I found this octopus staring out at me from on top of the reef. It was one of the biggest octos I have seen here. After a few pictures of it under a ledge it took off in a cloud of ink. That is when Heidi realized that this octopus was missing some of its arms. Different wounds can be seen on the head and mantle of the octo as well. Their main natural predators are moray eels but this guy was so big that I think he must have had a run in with a hunter of the human kind. People love to eat octopus out here in Hawaii. It is called Tako, so be careful when you order taco at a restaurant, you might get a plate full of octopus. And while octo can be prepared in many tasty ways, I love these guys way too much out on the reefs to ever catch them. As with most fish and marine life I would much rather shoot them with a camera than a spear. This octo casually swam all over the reef with Heidi and me in tow snapping pictures as we went. At one point he came very close to an undulated moray eel sticking out of a crevice after which the octo picked up its pace. As I was still mesmerized with my octo find Heidi sounded her tank banger wildly so I knew she had something good. I looked to where she was pointing and to my amazement saw a big volleyball sized frogfish swimming next to the reef. After a bit it landed in a spot, and used its modified fins like arms and legs to wedge into its new spot. Frogfish can be so hard to spot when they are not moving. Their camouflage makes them look just like a sponge. To see one swimming out in the open was amazing. Heidi found another similar frogfish a little farther down the reef so maybe these two were in some kind of frogfish courtship. Apparently not even that can take the grumpy look away. Still one of my favorite fish to see. It is becoming a tradition on this blog at the end of the year to wrap up a year in review with some of my favorite pictures and biggest adventures. This past year has been one of exploration into the blue waters surrounding the Hawaiian islands and beyond. Some encounters immediately come to mind like coming face to face with an oceanic white tip shark and nose to nose with a curious monk seal, while others sparked memories as I stumbled upon the pictures and stories of blog posts from 2012. The year started with humpback whales in full force here in Maui. It was my second whale season which made a huge difference in my knowledge and experience base to draw from as a naturalist with Pacific Whale Foundation. I soon had to start a new pool as I moved into the position of captain on several of the boats. Now at the end of the year I am starting my second whale season as a captain and loving it. It took some luck, determination, and serious underwater exploring to find some of my bucket list sea creatures this year. Swimming with mahi mahi was high on my list. I finally found them under a drifting net in about 10,000ft of water. 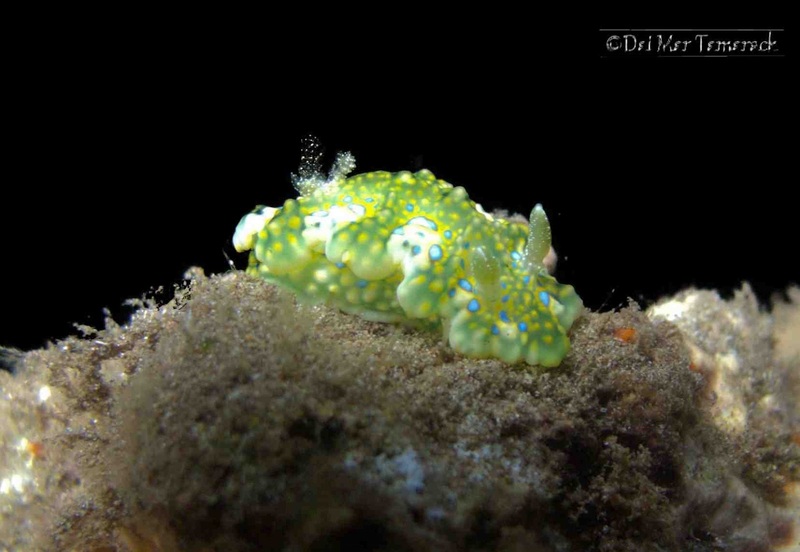 For my big nudibranch of the year it was much shallower, in about 15ft of water, but at night that Heidi and I found the rarely seen but highly prized jolly green giant. While the reef diving is amazing, and even though Molokini is only a kayak paddle away (4 times this year), it was muck diving that really stole the show. Nudi flats we call it for all the rare and wonderful nudibranchs we find there. This picture of Heidi and a sea hare wasn't picked because its the best lighting or visibility, but because it is a perfect representation of how we feel about muck diving. I am sure there will be many more muck dives in 2013. One of my fondest underwater memories came in the form of an unlikely marine mammal, the endangered Hawaiian monk seal. This curious seal couldn't get enough of my camera set up and I couldn't get enough of him. Luckily I snapped this portrait to remember him by. 2012 was also a good year for visits from friends and family. Hawaii is a good place to find friends from all my past homes. Savannah friends, Toyon Bay, Japan, Tole Mour, UGA, UHH, and more. I love showing off my home out here and never mind playing the tour guide. Already my calender is starting to fill with promises of more visits from friends! Plus this gives me a great reason to go explore new places around Maui. In 2012 I discovered places like Venus Pool and Poli Poli thanks to visitors giving me the motivation to get off the usual path. Then there was the surfing. From big winter swells at Honolua to glassy barrels in Indonesia I got my share of surfing in. This barrel picture made carrying my own surfboard to Indonesia totally worth it. Speaking of Indonesia! I took the month of October off from work to surf, dive, and explore the islands of Indo. Heidi joined me for 3 weeks as we put the afterburners on and jet setted around the islands. We explored rice terraced hillsides and battled some of the most dangerous driving conditions, we watched the sunset over the Komodo Islands, and searched out the muck diving capital of the world at Lembeh Strait. We found nudibranchs, frogfish, sea horses, and the deadly blue ringed octopus. And then came face to face with a living dinosaur, the Komodo dragon. Our taste of Indonesia may have been so sweet we will have to go back! My last big adventure of the year was a quick trip to the Big Island. Heidi and I hopped over to the Big Island several times this year for the diving but this time we had a major goal in mind, to see the lava. Reports that the lava flow had finally started going into the ocean again reached us in late November. So we hopped over, were totally set up by my friend Erica, and managed to hike out to see the lava at twilight. Cross another adventure off the list. Humpback Whale Season in Maui!